November 2012 is a long way off but at this point PPP's national polling is finding 2 tiers of electability for the Republican Presidential candidates. The first tier is Mitt Romney. The second tier is everyone else. Our monthly national poll finds Romney within 2 points of Barack Obama at 47-45, the closest he's been in 7 months. The rest of the Republicans tested all trail the President by double digits. Romney's improved standing against Obama is another sign of his increasing strength with GOP voters. Obama's level of support is pretty similar to where it's been throughout the year but Romney's gone from a 64 point lead with Republicans (77-13) on our last national poll to now a 77 point advantage with them (86-9) on this one. GOP partisans are increasingly saying that whether they support Romney in the primary or not, they're happy to vote for him in the fall. Against the rest of the Republican field Obama continues to hold comfortable leads. It's 10 points over Herman Cain at 48-38, 11 points over Tim Pawlenty at 50-39, 13 over Newt Gingrich at 52-39, and 14 over Sarah Palin at 52-38. -Gingrich has done the impossible...make Palin look popular. His favorability is 16/68, a net 22 points worse than hers. His favorability with independents is a staggeringly bad 10/76 and even with Republicans it's 32/50. It really leaves you wondering why he's still doing this. -Touched on this in South Carolina last week but any thought that Cain is going to cut into Obama's share of the black vote is probably misguided. He gets 8% on this poll, which is the same amount Pawlenty, Romney, and Gingrich get. And it's not just that black voters aren't planning to vote for Cain, they don't like him either. His favorability is 11/54 with them. We figured the public's guess is as good as anyone else's about whether Palin is running for President or not so we asked- only 34% of voters think she'll seek the White House to 49% who think she will not and 17% who didn't offer an opinion. What's interesting is that voters who don't like Palin are more inclined to think she's running than voters who do like her. 40% of Democrats but just 28% of Republicans think she's in. Most people probably don't even know who Herman Cain is at this point. You should poll to see if Donald Trump plays a spoiler role as a 3rd party candidate. Also Trump would make Newt look popular. Obama's numbers vs Romney are going to be in the toilet as long as the economy is perceived to be weakening, and Romney gets TV time to pummel Obama in the debates, without rebuttal. "You should poll to see if Donald Trump plays a spoiler role as a 3rd party candidate." We did that a few months ago, and he did then, but that was when he burst onto the scene and birtherism was riding high. His numbers with Republicans have plummeted since then, so I doubt he'd be as much a spoiler now. Not really sure why you leave out Ron Paul in head to head match ups with Obama, considering his appeal with independents is significant and that it costs you no more to include him in the poll. CNN found Ron Paul did even better than Romney vs. Obama. That Ron Paul wasn't included is a shame. Romney is going to win the nomination by default. The field is terrible. Romney is a decent candidate who could beat Obama if the economy is still struggling. Which is why the Republicans will continue to try to sabotage the economy... as always they put country last and their political power first. i really don't like ron paul's exclusion. 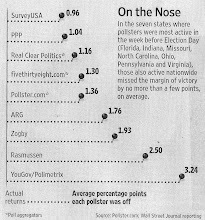 he was the best performing candidate in the last poll, now he's omitted from this one? "i really don't like ron paul's exclusion. he was the best performing candidate in the last poll, now he's omitted from this one?" Paul has never performed best in any poll. You Paulites can't make up facts.